Do not display degree sign near zero temperature. A couple of rare crashes and design glitches fixed. Došlo k řadě vzácných pádů. Naposledy upravil(a) milann70 dne 13. 02. 2019 07:02, celkem upraveno 1 x.
Horizontální orientace v telefonu je podporována v radaru, zásuvkách na šířku a vyhledávání míst.TV: nyní můžete vybrat poskytovatele počasí. Došlo k závažné nehodě, kterou jsme představili v předchozí sestavě. Hlavní interní modifikace (místa jsou nyní uložena v databázi pro zlepšení doby spuštění). This build introduces an updated Time-bar. The goal was to make Time-bar more informative. 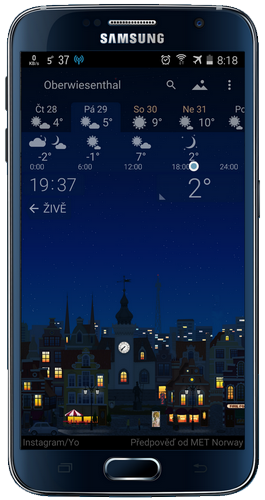 Display the weather from the current moment. 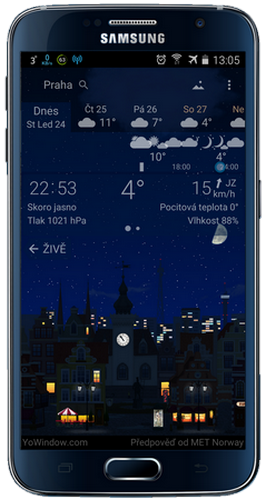 Since the beginning, YoWindow used to display the weather for today from 0:00 to 24:00 hours. Unfortunately, the horizontal space is limited on the screen of a phone. We have to squeeze all the weather changes in this narrow space. At 12:00 it's even worse. There's just half of the screen left to display the weather for the rest of the day. By the end of the day, Time-bar becomes barely useful. So we came up with an idea how to fix this. What if we fill Time-bar starting from the current time? For example, at 6:00 Time-bar starts at 6:00 and ends at 24:00. The useless night time is not displayed. The whole bar is filled with the weather. 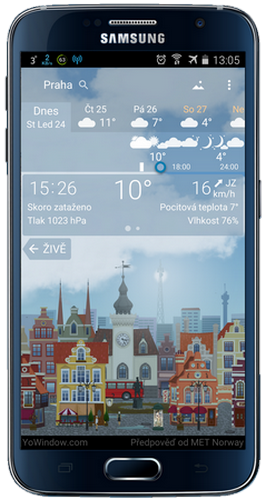 The best thing - you see more weather details now. This logic works until 9:00 in the morning. After 9:00, Time-bar keeps displaying the day from 9:00 to 24:00. Tomorrow. By the end of the day there's not much weather left to display on Time-bar. Time-bar looks useless. On the other hand, most people care about the weather for Tomorrow morning. Turned out we can display Tomorrow weather to the right of Time-bar. So you see the next morning weather right away. Naposledy upravil(a) milann70 dne 21. 03. 2019 02:44, celkem upraveno 1 x. 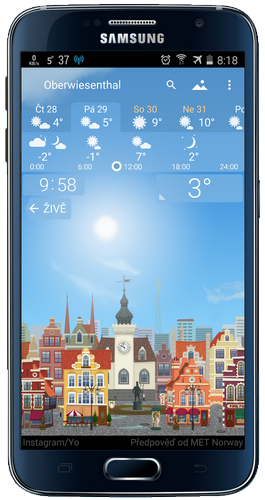 FIXED: Hodiny widgety vypadají zkreslené po otočení telefonu na některých zařízeních. Radar: zobrazuje se předpověď počasí spolu s nahrávkami radaru. Naposledy upravil(a) milann70 dne 21. 03. 2019 02:37, celkem upraveno 4 x.
Wallpaper: dark glass removed automatically in the night, so you can see the landscape better. Wallpaper: reflection effect at the bottom instead of black bar. Weather map: short term weather forecast (1 hour intervals).